Imperial College London has developed a new catalytic converter that can save fuel and reduce CO2 emissions. The new device is smaller, lighter and cheaper than current catalytic converters and uses up to 80 per cent less rare metals. A catalytic converter is the component in a vehicle’s exhaust system that eliminates harmful emissions and tests by Imperial College London suggest that the new prototype could reduce fuel consumption by up to three per cent. The new unit will also ‘considerably reduce’ emission output, although no CO2 figures have been released. Key to the development of the prototype has been the reduction of rare metals, like platinum, which are commonly used in modern catalytic converters and susceptible to degradation. Internal tests suggest that the new device deteriorates by only four per cent over a distance of 62,000 miles, compared to 35 per cent for a standard catalytic converter. The catalytic converter has been created by Dr Benjamin Kingsbury who is a research associate in the Department of Chemical Engineering at the college. “The new catalytic converter is still undergoing long mileage tests, but we hope to have it finished and running on a car within 18 months,” said Dr Benjamin Kingsbury. 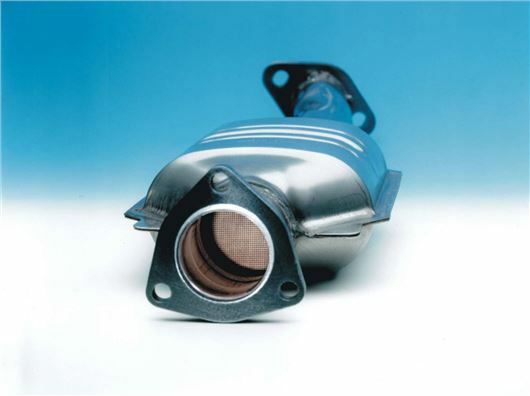 Catalytic converters are not designed to reduce CO2 emissions. Their job is to oxidise carbon monoxide to harmless carbon dioxide, whilst simultaneously reducing nitrogen oxides to nitrogen and oxygen, and oxidising unburned hydrocarbons. If anything, CO2 emissions will be increased. he has not said CO2 emissions will be increased but that no figures have been released yet.he just said that emissions will decrease.